Now firmly established in the UK air show calendar this years Air Display and Classic Car show at Rougham promised to be the biggest yet according to the events organisers. Historically the majority of the flying has been on the Sunday of the event but this year Saturday also had a four hour flying display with both days offering a slightly different programme. The line up usually consists of "Rougham regulars" along with carefully selected display items. Deciding what day to go proved tricky but with the weather forecast looking more favourable for the Sunday I opted to go to the show on that day. Stuart Norris made the short trip to Suffolk for UKAR. Additional photography by Phil Whalley. Rougham airfield started life as Station 468, RAF Bury St. Edmunds, when opened in 1942, and was to become a USAAF bomber base operating A-20 Havocs, B-26 Marauders and, for most of its wartime existence, B-17s of the 94th Bomb Group. One of the attractions at Rougham is the 1940's area which recreates how the airfield would have looked during the Second World War. This year ground crew could be seen practicing baseball, whilst military trucks were positioned ready to load or unload the visiting Dakota of Aces High, the paint scheme of which gives it a genuine "workhorse" appearance. The US theme continued throughout the day's flying program. Flying got underway an hour earlier than advertised with 'surprise guests' from nearby RAF Lakenheath. With A-10s deployed there in numbers for an exercise, there had been much speculation as to what the guests would be in the week leading up to the show. They turned out to be a pair of F-15C Eagles from the 493rd FS, 48 FW, which made a couple of formation flypasts, lighting their afterburners on the second pass before heading off to an air combat manoeuvre training exercise. 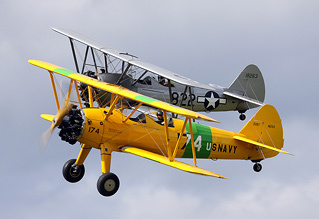 At the opposite end of the spectrum the show was closed by the Boeing Stearman Formation from Old Buckenham flying a stunning yellow and a silver example of the breed in what was their last ever display before retirement after nineteen years on the circuit. 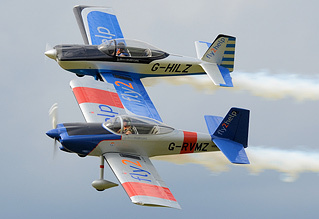 Pilots Gerry Honey and Dave Bagshaw put on their usual impressive routine to end the day. Other US themed participants included Dave Puleston in an L4 Cub, the aforementioned DC3 and fittingly a sequence involving B-17G Flying Fortress Sally B and the two P-51D Mustangs Janie and Marinell, both belonging to Maurice Hammond. With Dave Evans flying Janie and Maurice in Marinell the pair carried out their pairs and individual routines before Janie headed off to display at Headcorn, leaving Marinell to join up with Sally B as her 'little friend' for a single pass before the B-17 took centre stage above the field from which her forebears operated during the fierce battles of the Second World War. A pair of BBMF Spitfires were due to appear but only one was able to make Rougham, that being the Mark Vb AB910 flown by Sqn Ldr Duncan Mason. There was however to be another Spitfire appearance during the day with the late addition that of Dan Griffith flying the 'Kent Spitfire', Mk IX TA805, in his inimitable flamboyant style, and continuing Rougham's tradition of attracting impromptu displays from 'passing trade'. Dan's display was the highlight of the day for many people, and probably the best Spitfire display I've seen since the late great Ray Hanna. Other military items included Clive Denny in the 'Me108' performing an airfield attack with accompanying sirens and the usual pyrotechnics, simulating anti-aircraft fire and strafing runs from the '108. The Great War Team of string and canvas replicas made a welcome return, recreating dogfights seen over the trenches during the First World War. The team flew a pair each of SE5a and Junkers CL.1 replicas as well as a single Sopwith Triplane. The most eye opening flying of the day was by Brendan O'Brien in his yellow Super Cub, apparently having taken to the air without a clue in how to fly but of course putting on a show of brilliantly controlled but seemingly perilous flying as only he can. For good measure Brendan repeated his party trick from last year and made two passes through the poplar trees on the far side of the airfield! Mark Miller brought his Dragon Rapide to the show as did the RV8Tors, Alister Kay and Andy Hill. Howard Cook made a most welcome appearance after his serious injuries sustained in 2009, flying alongside Clive Denny as a Tiger Moth/Chipmunk training pair. "Rougham regulars" mainly consisted of two ship teams, with Dave Puleston making his second appearance of the day along with Richard Grace in the Pitts Duo, Matthew Hill and Bob Grimstead 'Aerial Balleting' their RedHawks Fournier RF4Ds. Solo displays came from John Elliot in his MT-03 Autogyro, the weather allowed John to make his "hands off pass", and East Anglian favourite Nigel Willson displayed his Yak52 in a familiar polished routine which included talking through a Lomcevak manoeuvre live over the radio! 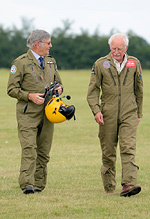 Rougham 2011 was blessed with fair weather and a full flying program befitting this historic and picturesque setting. In addition to the four hour flying display there were 200 classic cars and numerous other attractions. The admission prices on the day were: £13 for an adult, £11 for 12-18 year olds and concessions with under 12's getting in for free. The programme was priced at just £2. Great value for money in anyone's book. The crowd on Sunday was the largest I can remember seeing at Rougham and that was reflected in the tailbacks at the exits. It took half an hour to get out of the car park but the traffic was efficiently marshalled to ease the flow. Next year's show was to be a commemorative event in honour the airmen of the USAAF's 8th Air Force, who arrived at the airfield 70 years ago. However the Bury Free Press recently published a story claiming that 2011 was in fact the last show to be held at Rougham, following the sad death of Sir John Agnew in June. 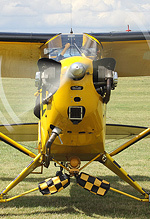 We've been in contact with the airfield ourselves and can confirm that there are no plans for Rougham Airfield to stage any of it's own events in 2012.